Kentucky Fried Chicken was founded by Harland Sanders (known as Colonel Sanders), who opened his first restaurant in 1952. Kentucky Fried Chicken was later changed to KFC to create a healthier image to consumers, but irrespective of their efforts to develop a health-conscious brand, the most popular dish today still remains their famous original recipe fried chicken. To put their success in perspective: In 2017, KFC held 21 487 restaurants worldwide. In South Africa alone, KFC still ranks 1st on the fast food industry list, with 840 stores nationwide. Despite the tough economic environment over the past year, KFC still continued to open more stores to supply the demand of South Africa’s favourite meal. Part of KFC’s continued growth drive is to implement effective business processes which also serve its customers as best as possible. A key element of this is to ensure fast and trusted check-out transactions, and to do this they need to ensure trusted communication for the point-of-sale infrastructure. Using the normal mobile networks with 3G data connectivity could simply not provide KFC with reliable communication for the point-of-sale services. The poor 3G communication was leading to revenue loss and customer frustrations, which simply could not be afforded anymore. FNB recently partnered with Q-KON to develop a very reliable satellite communication network that provided trusted communication for business point-of-sale solutions. This satellite network provides a network reliability of 99,95% uptime, with data transaction costs lower than 3G bundles and equipment pricing included in the FNB financial services package. The solution is implemented by installing a two-way data satellite terminal at the customer’s premises. This integrates with the business point-of-sale devices either with cable or over a secure wireless network. This solution can thus also be used for communication at larger business premises, which could include restaurant areas, or bar facilities and even outside pool areas. As an FNB certified solution, the end-to-end satellite and wireless network is fully compliant with all current financial security requirements. In addition, Q-KON provides FNB with on-site and remote support to ensure continued business operation anywhere in South Africa. 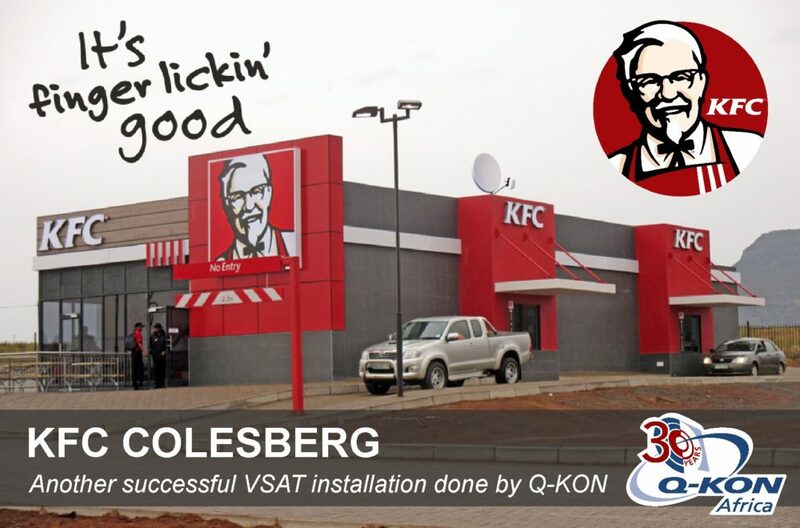 Q-KON has so far successfully completed 16 KFC VSAT projects, consisting of eight Stimulus sites, two Gunret Food sites and 6 KFC Chargo sites. These sites, famous for their “off-grid” nature, can now benefit from the satellite PoS solution. “We really can’t complain, as we have seen a tremendous improvement in the uptime at these stores, in comparison of how it was. The support from the Q-KON team is excellent!” says Michael Davel of Gunret Foods. Overview of how the Twoobii solution enables Telephony Services. Does snow damage your Twoobii signal?